This simple maintenance routine will keep your French horn playing and looking its best for many years. 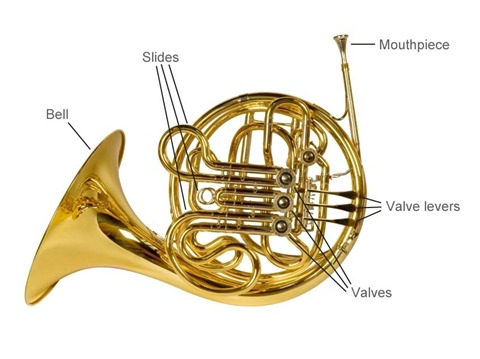 Lift your French horn from its case by the bell and large tubing (not by the valve levers or small slides). Every two or three days apply rotor oil to the valves. For each valve, hold down its lever and remove its slide; turn the French horn up, and put a few drops of rotor oil into the tube, working the valve lever to distribute the oil. Replace the slide and repeat the process on the next valve. Remove the mouthpiece and put it in its special compartment (so it doesn't bounce around in the case and dent your French horn). Check for loose items in your case that could bounce into your French horn and dent or scratch it. Don't store anything (music, a towel, etc.) on top of your French horn in its case as they will push on the levers and slides and bend them. Apply a little slide grease to the slides. 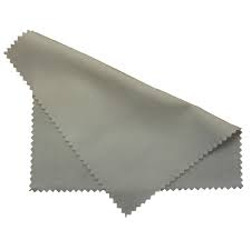 Pull them out one-at-a-time, wipe them clean with a soft cloth, rub a small amount of slide grease on them, and carefully insert them back into your French horn. Oil the rotors. Remove the valve caps and apply key oil to the bearing shaft and pivot points, rotating the valves to work it in. Every few months wash out the insides of your French horn to keep it sanitary and working smoothly. Disassemble your French horn (except for the rotor valves which only a technician should disassemble) in a large sink or bathtub of warm water and mild dish soap. (Be very careful with the disassembled parts as the smallest dent will prevent them from fitting back in your French horn and moving properly. A soft towel on the counter and at the bottom of the sink or tub will cushion any falls.) 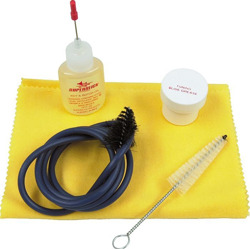 Use your long tube brush to gently scrub inside the tubes. Rinse thoroughly and dry off the parts. Apply a small amount of grease to the slides and put them back into your French horn. Bring your French horn to the Amro repair shop at least once a year and any time you feel it's not playing its best. We'll inspect and test it free of charge, usually while you wait. And if you have Amro’s Maintenance & Replacement plan, any adjustments and repair it needs are free.